Following on from Part 1 of Larkspur to Clansman, we continue with an overview of the manpack sets and antenna systems used for vehicle installations. 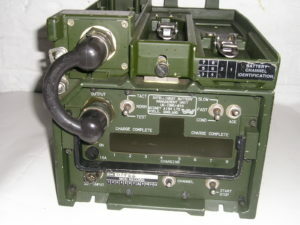 There are principally three manpack sets in the Clansman series that are useful to the radio amateur; these are the RT320 (PRC320) HF Transmitter-Receiver, RT351 (PRC351) and RT350 (PRC350) being VHF equipment’s. The RT320 covers 1.9-29.9999 MHz with SSB (USB) AM & CW modes at 30 Watts pep RF output. Designed in the early 1970s and manufactured principally by Plessey and RACAL BCC. The RT320 uses RF circuitry that is quite advanced for its time. The programmable digital synthesis employed for frequency generation being an early example of the use of this technology. The frequency synthesizer modules use custom-made surface mount chips produced exclusively by Plessey. Special high voltage Tantalum capacitors are also used, but more on this subject in a later article. The RT320 is continuously tuneable over the entire frequency range in 100Hz steps. And as with all of the sets in the Clansman series, frequency control is locked to a high stability temperature controlled crystal oscillator (TCXO). Power required is 24V from an 4Ah or later type 5Ah Nickel Cadmium battery. Batteries may be charged or floated whilst connected to the radio by use of a DC Charge Unit (DCCU). These are available in 28 or 14 Volt versions for both FFR (Fitted For Radio) and GS (General Service) vehicle installations. There is also a mains charger unit (ACCU) and Intelligent Battery Management Unit (IBMU) that can charge and condition up to eight batteries depending upon the tray fitted.. 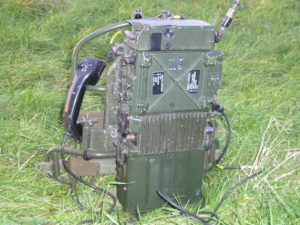 The RT320 was primarily designed for communications outside the coverage of the VHF sets. The ground wave range using SSB is about 35 km over most terrain in Western Europe. When used with the wire or dipole antenna range is greatly extended. 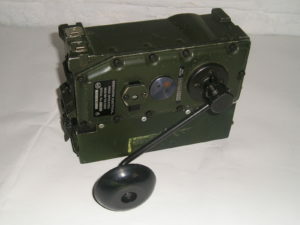 The RT320 does not have motorised tuning like the RT321, but nevertheless does feature automatic tuning of the receiver circuitry. This is accomplished by the use of Varicap Diodes and electronic voltage control. The relatively high swing in capacitance required to cover the entire tuning range, needs a large change in voltage. The power supply module produces the highly stabilized 110-volt supply dedicated to this purpose. The antenna used in the manpack role is a 2.4 metre whip with shock spring (Gooseneck) mount. This is effectively tuned by a good internal ATU (Aerial Tuning Unit) employing permeability tuning and manually switched ferrite cored inductor. There are external terminals for wire antennas and a BNC socket for direct connection to a Dipole. The official accessory kit contains Kevlar reinforced braided wire for long-wire & dipole, antennas, together with centre termination and 50 Ohm coaxial feeder. The RT320 is a very useful portable set for the amateur, as unlike the RT321 it can be quickly tuned by the front panel decade frequency controls. This permits fairly quick tuning around the selected frequency of the band in use. The continuous frequency coverage also makes the RT320 an ideal set for NVIS (Near Vertical Incidence Skywave contacts on the 60 metre (5MHz) allocations. The RT351 is the principal VHF manpack covering 30-75.975MHz FM with 4-Watts RF output. 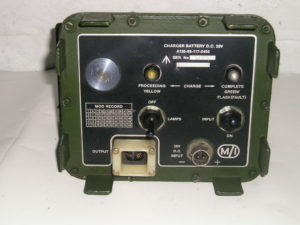 Battery power uses the same batteries as the RT320 but with the option of a 1 Ah NiCd charged by a Hand Generator for use in remote locations. The photograph shows the RT351 with SURF 4W (Selector Unit RF) mounted on top. The SURF is only needed when two or more radios are operated close together and will be covered in more detail when we look at Clansman Accessories. Generator Electrical Hand Operated with 1A/h Battery. The RT351 is tuneable in 25 kHz steps giving a total of 1841 channels within the frequencies covered. For the radio amateur the RT351 is a good portable transceiver as it covers both the 4 metre and 6 metre bands. However the 25 kHz channel steps do not allow access to the 6 metre calling channel etc which is based on 10 kHz increments! And allocated before the current abundant availability of Clansman sets! Fortunately many military radio enthusiasts have now established 51.600 MHz as a calling and working channel. This is in the FM wide deviation (12.5 kHz) segment of this band. 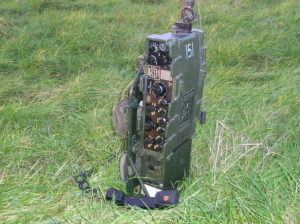 An alternative channel of 51.70 MHz is often used by amateurs with military vehicles at shows and rallies. Whilst the RT351 normally runs 4 Watts RF output this can be increased to 20 Watts by the addition of Amplifier RF 20W. This is a bolt on option that fits on the bottom of the 351 between the set and the battery. The output from the transceiver is linked to the amplifier by a short coaxial cable. This converts the RT351 to the RT352 (PRC352) and effectively doubles the working range to about 16 km. 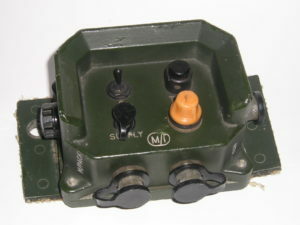 When used in the manpack role the amplifier is always switched off and the standard whip aerial connected. This is mainly because of the critical aerial match required by the amplifier, which switches out of circuit if the correct impedance range is not presented. There is also the safety consideration that the operator would be too close to the relatively high RF field. For stationary portable operation the amplifier is usually connected to a base loaded Ground-Spike antenna. This allows the operator to locate several metres away from the antenna, reducing RF exposure and also allowing concealment of position. When used in a vehicle the RT352 is connected to an Initiate Box via the second 7 pin audio socket SKT2. This provides control for the TUAAM (Tuning Unit Automatic Antenna Matching) normally fitted to FFR vehicles. This is a physically smaller transceiver, which is in many ways, similar to the RT351 but with reduced frequency coverage and output power. Tuning between 36 to 56.975 MHz FM with 1.5 Watts RF output, the RT350 is a good 6-metre transceiver for portable use. Working range is about 2-4km or much more from an elevated location. The RT350 uses either rechargeable 14.4V 4Ah NiCd batteries or a handy Dry cell pack taking 14 “C” Alkaline cells. The 4Ah rechargeable packs may be charged with the IBMU using an appropriate battery adaptor tray. There are several antennas that fit both the RT351 and 350 all with bayonet fixings. The standard 1.2-metre four-section whip, made from Titanium, 0.65m flexible “Battle” whip and 1.2 metre trailing wire, for short range use where maximum concealment is required. The RT350 can be connected to an external antenna such as the ground-spike by use of the BNC adaptor cable supplied but it is not suitable for use with a TUAAM. The VHF aerials fitted to FFR vehicles were normally installed on boxes bolted to the front wings of the vehicle. Larkspur used manually adjusted tuners feeding a Vertical whip antenna. Large changes in frequency would require the operator to retune the aerial manually at the wing box. The Clansman system is different; the TUAAM used with the fixed and portable VHF sets will tune the antenna automatically. For the RT352 pressing the TUNE button on the Initiate Box sends a tune command to the TUAAM. Three Servo controlled motors vary matching circuit capacitance for an acceptable VSWR (Voltage Standing Wave Ratio). There is also a “Silent” tune mode, which tunes the equipment into a dummy load to help prevent direction finding of the stations position during sensitive situations. Once radio silence is broken the antenna is then properly tuned into the antenna as normal.. The TUAAM tunes 30-77 MHz using a 2 metre long whip consisting of two 1-metre antenna sections, one steel rod NSN 5895-88-630-8456 and glassfibre top section NSN 5985-99-649-8140. When used with the RT353, (previously described in Part 1) this requires an ARFAT (Apparatus Radio Frequency Antenna Tuning) to be connected in the antenna circuit. The ARFAT is also linked to the 12-pin Control connector on the RT353. Whilst yet another apparently uninteresting black box the ARFAT contains some control electronics with temperature sensing and a thick film dummy load to allow the 50 Watt RT353 to be tuned under radio silence conditions. This addition is necessary as the TUAAM only contains a very basic load just capable of dissipating the 20-Watts or so from an RT352. It is worth noting that the heavy aluminium disc under the aerial mount is not just a spacer but also contains a 1:1 Transformer.. This provides DC grounding to the antenna thus improving EM performance. Nominal 50 Ohm impedance coaxial cable fitted with BNC plugs is used to connect between the Amplifier RF 20W and TUAAM. On some installations the Amplifier RF and TUAAM are both fitted inside the vehicle. In this situation antennas are either mounted on the superstructure or side pedestals. Base Antenna Element being fitted under the mounts of all of the VHF antennas. HF antennas for the RT320 or 321 are normally fitted to mounts on pedestals at the sides of the vehicle. The antenna lengths used are usually 3 metres for the RT320 and either 3 or 4 metres for the RT321. The antenna feeders are just a simple rubber insulated stranded wire that is kept as short as possible. Due to the high voltages produced in the vehicle HF feeders, Bowl Insulators are threaded over the entire length of antenna lead. Even 25 Watts RF can burn through PVC insulated wires where they come close to conducting surfaces, particularly at lower frequencies. Rubber or PTFE covered leads with Bowl Insulators should be used on all HF feeders fitted to military vehicles. RT351 and RT353 being particular areas of failure. Whilst these are easily accessible and repairable, some of the components are getting difficult to obtain. Also the correct testing of these assemblies requires special to type field test equipment. The author’s advice is to only purchase equipment from sellers that can demonstrate that it has been properly serviced and tested. Otherwise those that are adept with a soldering iron and signal generator may wish to try their skills repairing one of the many faulty Clansman sets. Whilst the radios are relatively complex, detailed service information is contained in the EMERS (Electrical and Mechanical Engineering Manuals) These are available from the Vintage and Military Amateur Radio Society (VMARS) www.vmars.org.uk and are free to members. Part 3 in this series of articles under preparation, examines some of the Clansman accessories and Automatic Rebroadcast operation.